As a first-timer to City Winery, I was immediately entranced by the intimacy of the venue and its immediate warmth (literally and figuratively, as it is Chicago weather we're currently grappling with). Long tables dotted with tea light candles allowed the room to contain an effervescent glow, and I thought to myself that a very distinct caliber of musicians must play shows in such a gentle space. As my friend and I sat at a table with new friends, I overheard a gentleman say, "it's an old saying, when you speak from the heart, it goes straight to the heart. When you speak from the tongue, it stops there. David Broza, he speaks from the heart." I had not seen Broza perform live before, but I had the feeling after hearing this sentiment that it would be a beautiful concert. 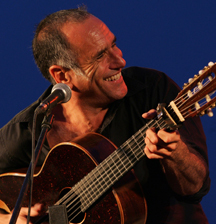 If you are unfamiliar with David Broza, he is touted as the Bruce Springsteen of Israel, and after seeing him perform, I understand the comparison. Charismatic and charming, you can tell that he is truly passionate about the music he creates as he commands the room with his ebullient energy. Native to Israel, Broza has also resided in Spain and England, forming an impressive melange of cultural backgrounds and insight. The richness of his cultural framework has allowed him to dabble in many musical styles as well, which permeate his musical style completely. The beginning of the show featured an acoustic set by Broza, during which he walked onstage completely beaming. While singing songs in Hebrew, Spanish and English, the first two being languages that I do not speak, this fact didn't even matter as the emotion was easily conveyed through Broza's infectious spirit and I could sense the message that Broza intended to send with his music, without even knowing each of the words that were sung. Many of his songs involved his deep love of poetry, during which he incorporated the words of famous poems by Federico Garcia Lorca. Utilizing flamenco guitar flourishes and a low tenor voice, Broza was able to convey the romantic nature of the poems themselves easily as they were brought into musical form. Later bringing a full band on stage with him, Broza established a genuine rapport with the audience as he played a variety of tunes. Included in his set was a cover of Elvis Costello's "Everyday I Write The Book," which, no offense to the great Costello, but this languid, ambling version was simply stunning. Another gem within the set was "The Lion's Den," which put the words of Judea Pearl to song that he wrote after the death of his son, journalist Daniel Pearl, and though darker than some of Broza's material, the deeper message of truth and peace shone through. Playing many songs off of his new album, East Jerusalem / West Jersusalem, I began to notice that the revolving message was one of spreading peace and acting directly from love. It was refreshing, and I couldn't help notice the contented energy that had settled within City Winery as we listened to music emblazoned with hope. The messages he creates tie into his identity not only as a musician, but a humanitarian as well. Since 1977, Broza has been working towards creating peace through music in order to alleviate the issue of Israeli-Palestinian conflict, including collaboration with Palestinian music groups, recording his latest album in East Jerusalem, and the creation of the Israeli peace anthem via his monumental ballad "Yiyhe Tov (Things Will Get Better)." He has collaborated with a wide range of individuals from all around the world, from American musical figures such as Wyclef Jean, to Palestinian-Israeli songstress Mira Awad, who joined Broza onstage and sang a few songs for the crowd. Awad imparted her own messages of peace for the audience, with songs that featured only the rich clarity of her own voice, including haunting ballads that were heartfelt and moving. As Broza stepped back onstage and the set weaved through the list, I was amazed at the musical diversity present before us. One song featured the mystical melodies of Middle Eastern instrument, the oud, while the next showcased primarily a rapidly paced acoustic guitar. As the set moved forward throughout its two and a half hour duration, time seemed to slip away. The show swiftly adjusted from a mere concert, to a spiritual experience. Seen throughout the crowd were listeners clapping and swaying, to a group in the front corner hugging, dancing, and embracing each other's company. As the set neared its end, Broza performed his cover of Nick Lowe's "(What's So Funny 'Bout) Peace Love and Understanding," as the mantra of his mindset of peace resonated strongly with the audience. As Broza ended the show with "Yiyhe Tov," City Winery was glowing, illuminated by candlelight, as listeners held their table's tea light up in the air and sang words entrenched in heartfelt exuberance. It's very special when you can literally feel the energy from music within a concert venue, and David Broza was able to bring an air of light and wonder to listeners as he imparted a message of peace to all.